Police repulse demonstrators seeking to enter men's compound in protest against separation at Chabad event in heart of Tel Aviv. 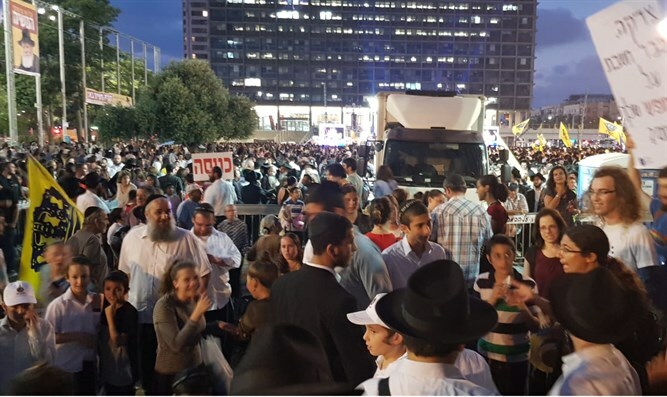 Leftist protesters arrived this evening at Rabin Square in Tel Aviv to protest a Chabad rally in which women were separated from men. Police announced the protesters "violated public order" and repulsed them. Demonstrators shouted "Woman's blood is no different." Some women were able to cross the barrier to the men's area. The Tel Aviv District Court on Sunday ordered the opening of the event separate for men and women in Rabin Square in Tel Aviv. The decision was made in a petition submitted by the Association for the True and Complete Redemption, which is affiliated with the messianic faction in Chabad, against the ban on separation imposed by the Tel Aviv municipality. In the hearing, Judge Kobi Vardi attacked the municipality's position and the organizations petitioning against the event, noting that "there's no reason not to hold the event with separation." The judge criticized the municipality for not holding a proper hearing for event organizers and for issuing the prohibition on gender separation at the last minute. The judge also rejected the claims of the Israel Women's Network and other organizations that wished to join the hearing as a friend of the court. "You want us to say: Women don't really want the separation freely, but with all due respect, this is their religion and that is their will."